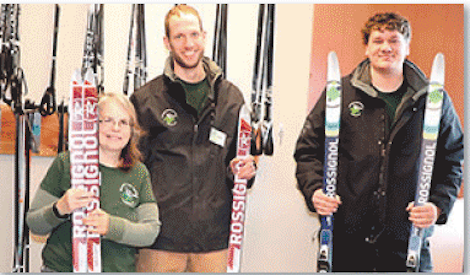 Massena Nature Center staff, from left, naturalist Linda Besio, facility and trails manager Joel Danko, and naturalist Thomas Boudreau display snowshoes and skis that can be used for free. MASSENA – Area residents can beat the “winter blues” with a visit to the Nicandri Nature Center for free cross-country ski and snowshoe rentals and lessons, inside exhibits and weekly events. The newly built $12 million nature center is in the second year of operation since the original center was destroyed by fire in 2010. Skiing and snowshoeing are popular activities, with about 100 people hitting the trails and about 300 total visitors each day on a warm winter weekend, said naturalist Linda Besio. Equipment loans of gear for all ages are available from 9 a.m.-4 p.m.
Six miles of marked trails are open from dawn to dusk daily. They are now groomed, making it even easier for cross-country skiing and snowshoeing. The schedule of activities, including outdoor trail guides, ski and snowshoe lessons, and events such as moonlight ski and snowshoe hikes, is online at www.massenanaturecenter.com. The trails offer views of the St. Lawrence River and wildlife sightings, such as deer, beaver, coyotes, owls and other birds. A hill for sledding is .25 miles, off the green trail near the bat house. The trail lengths range from .25- 1.5 miles. Visitors can feed birds by hand near several feeders. Binoculars and bird guide books are available for loan, and birding classes are regularly offered at the center. Day camps featuring hands-on science, wildlife and arts-and-crafts activities for children ages 6-12 are offered during many school vacations, including Feb. 18-23 from 10 a.m.-1 p.m. No registration is required, but participants should bring a lunch and clothes to go outside. Upon entering the center, a 1,500 gallon tank with live fish, turtles and frogs greets visitors. A river tank with many local fish species, a bee observatory and a dome-shaped container of cockroaches are also on view. Regular programs for preschoolers, such as Nature Nuts with stories, music and movement, take place on weekdays. Snowshoe photography walks, book club, and other adult activities are offered on weekday afternoons. After-school and weekend activities for older students include outdoor survival games, snow games, and snow painting. The nature center has four full-time and one part-time staff members, as well as about 20 regular volunteers, said Besio. A number of Trip Advisor reviews describe the friendly, helpful staff as one of its great assets. “We hope to continue to be a resource and hub for the community to find great opportunities to play outdoors and learn about nature,” said Thomas. The New York Power Authority owns and funds the center, named for Eugene Nicandri, a NYPA trustee and longtime Massena community leader who championed the efforts to rebuild the center. The Friends of the Nature Center manage it and provide the programming. The center is in Robert Moses State Park, 19 Robinson Bay Rd. On Robinson Bay Road, take the first left, which is easy to miss because it is not well marked. The center is behind the Park Police Station. For more information, visit the center’s website or call 315-705-5022.